(You may be interested, as I was, after reading the book, to hear an old recording of these lines here). 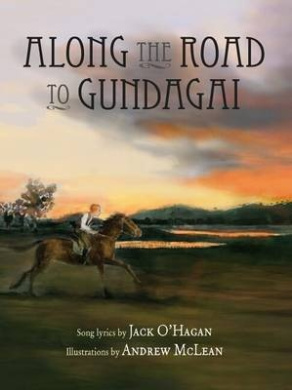 Most surprising of all, is the visual interpretation of the song in this picture book offering. Andrew McLean presents the song from the viewpoint of a soldier, yearning for his beautiful home as he fights and suffers on the battlefield. The contrast between scenes of horror on the Western Front, and the beauty of Gundagai are confronting, but in a beautiful, poignant way. On one spread soldiers and their horses flee a gas attack, the soldiers wearing gas masks, the horses’ eyes filled with fear and a ghastly yellow light surrounding them. This is in stark contrast to the preceding spread which shows young boys playing in the peaceful shallows of the Murrumbidgee river. Further contrast is added with the wartime scenes filling the whole spreads, while the remembered scenes of Gundagai are framed like favourite photographs or paintings. Most of the song lyrics are also on these home front spreads. This a beautiful, haunting book, outstanding for discussions of Australian history. With the song first written in 1922, McLean’s interpretation is true to the experiences of the war years not long prior, which would still have been very fresh in the public memory. For classroom use, it would be an interesting exercise to offer children the lyrics without the illustrations first, to highlight the contrast of what is then shown in the book. A surprising book, in the very best of ways. Stunning.